So in our last segment of Project Porsche 911 GT3RS, we installed Dundon Motorsports long tube headers and exhaust and picked up 16 wheel hp and 7 lb/ft of torque from our cars hyper tuned NA 4 liter motor under less than ideal conditions. The car’s engine is super sensitive to intake air temperature and the ECU starts to dial things back if the intake temperature goes above 78 degrees. We had done our baseline testing with cool intake air temp but our after header install intake air temps were in the high 70’s low 80’s, not good for optimal dyno results. With the headers and exhaust in place, we wanted to do some tuning to be able to extract the most out of them and to perhaps make our engine less temperature sensitive. The tuning help came from our friend Mitch McKee. 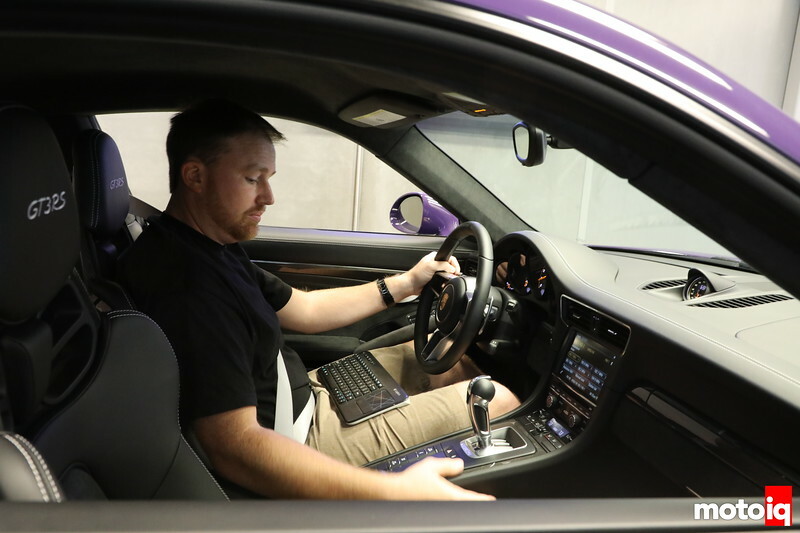 Mitch is one of Cobb Tunings ECU Engineers and he is very familiar with the workings of the Porsche ECU. Mitch was in town and we begged him to take a look at our car. 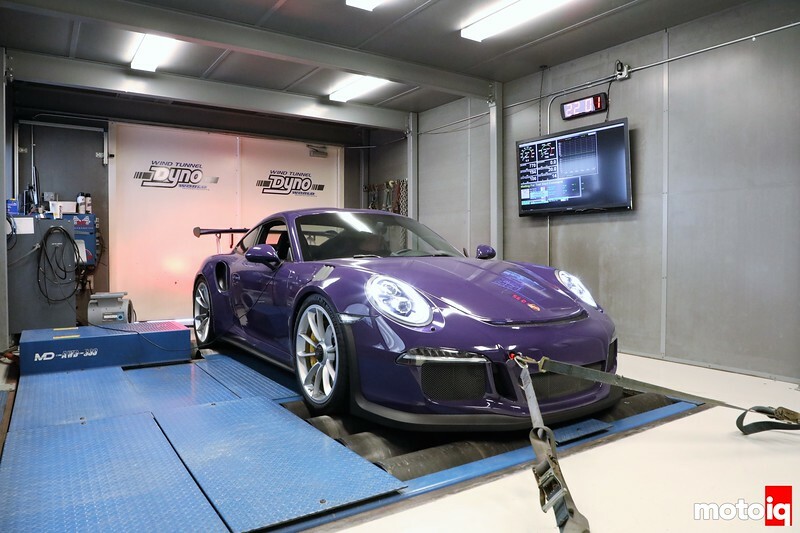 Since the GT3 is so temperature sensitive and we wanted to do the best possible job tuning, We booked time at what is fast becoming our favorite dyno, World Motorsports Wind Tunnel. Read more about Project GT3RS here! 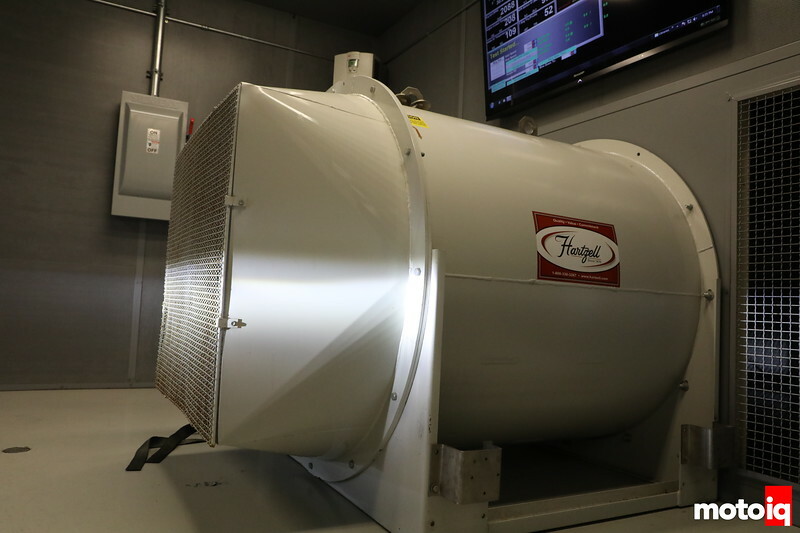 The magic maker of the Wind Tunnel dyno is this huge fan. 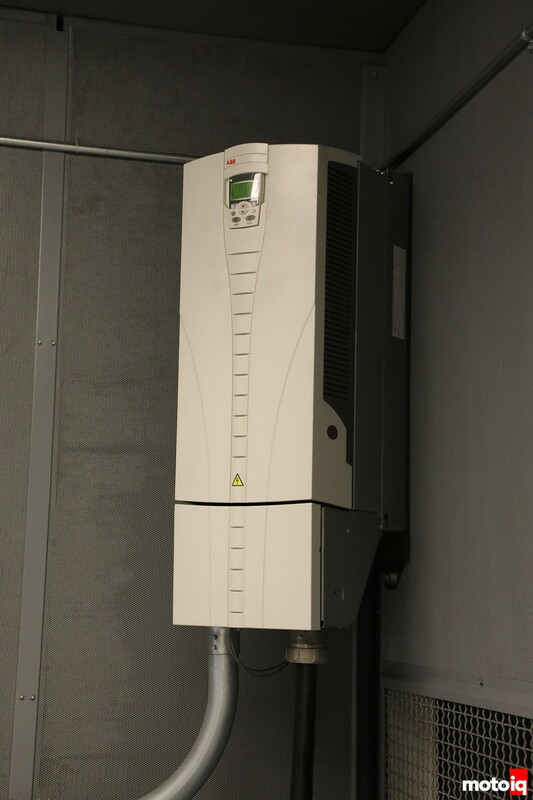 Capable of wind speeds of up to 140 mph, the fan is linked to the dyno and matches the dyno’s road speed. This requires over 300 hp. It’s one hell of an electric motor spinning that fan. 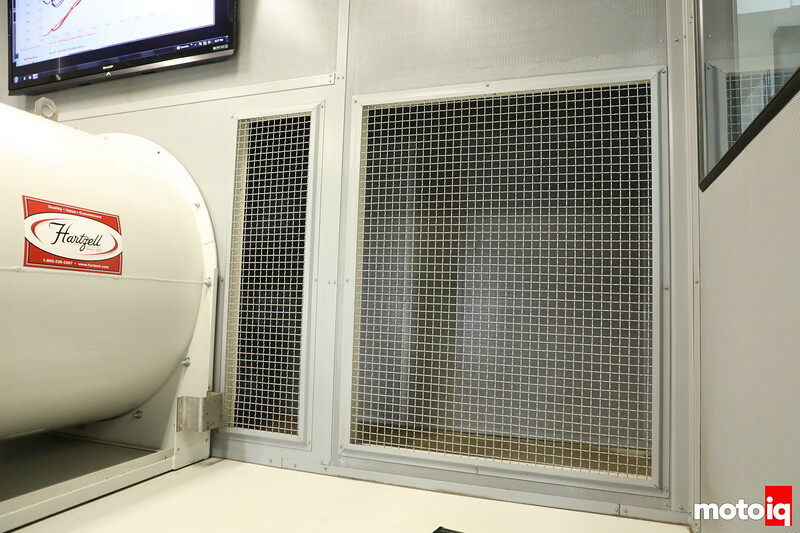 The World Motorsports dyno also has several other ducted fans to make for rapid air exchange in the dyno cell. These fans blow about as much air as a normal dyno fan and they cover the back wall! Here is the huge power supply for the main fan, looks like the one for your computer on steroids. Jon Hebbein gets our car set up on the dyno and does some pre-tuning baseline pulls. Great to see the skillz of a real tuner, extracting even more power from a high strung engine of this caliber. Do you know Mike, how much can be expected. If used 93 oct and in a cooler state/country with like 50-70 outside temps? Also consider this motor is direct injected “only” . would it handle to run E85 on stock injectors with only bigger fuel pumps? I think that there is another 10-20 hp from tuning for 93 octane and for keeping the intake air temp below 78 degrees. One thing with the tuning and richer AFR, I feel that the car is no longer so near the edge of detonation with it’S 13:1 compression ratio, hence it is not so sensitive to intake air temp. I think Mitch has found that if fuel was taken out of the equation, the engine makes the best power with about 6 degrees more total advance than what we are currently running on the 91 octane map. This could be accomplished with E85. The main issue with E85 is how it will affect the high-pressure fuel pump since ethanol has little lubricity. On some cars like Subarus, this has been an issue and they can only tolerate something like a 50/50 mixture of E85 to gasoline. There is also the possibility of running an additive to pre-mix some lube in. One other this is that I am sorta scared to experiment too radically on a super expensive motor! Or at least being the pioneering guinea pig. I forgot , of course it has a cam driven high pressure fuel pump because of the direct injection. No simple drop-in , into the fuel tank . Interesting to read, how you believe the fuel pump will not like E85 because of loss of lubricity. Now the 2018 motor with it’s both direct and port injection. Seems to handle with easy, switching over to E85. Without needing anything upgraded. But I guess the downside is, the complexity and expense when it comes to maintenance down the road. Yes, some other cars have issues with the high-pressure pump with ethanol and this is an expensive car to experiment with! It’s not so much pump capacity in this case but galling of the piston and bore of the pump which is under thousands of psi of pressure. Some cars are fine and others mess up after a few thousand miles. Video needed! 9000rpm of pure eargasm. That is coming but Jeff is lagging.